The closest big mountain experience to New York City is Hunter Mountain in the gorgeous Catskill Mountain range. In addition to being just a two-and-a-half hour drive from the city, it’s just one hour from both Albany and Stewart airports, two from LaGuardia, and two and a half from both JFK and Newark. Hunter Mountain is the second highest peak in the Catskills and the highest in Greene County. Base elevation is 1,600 feet and peak elevation is 3,200 feet. 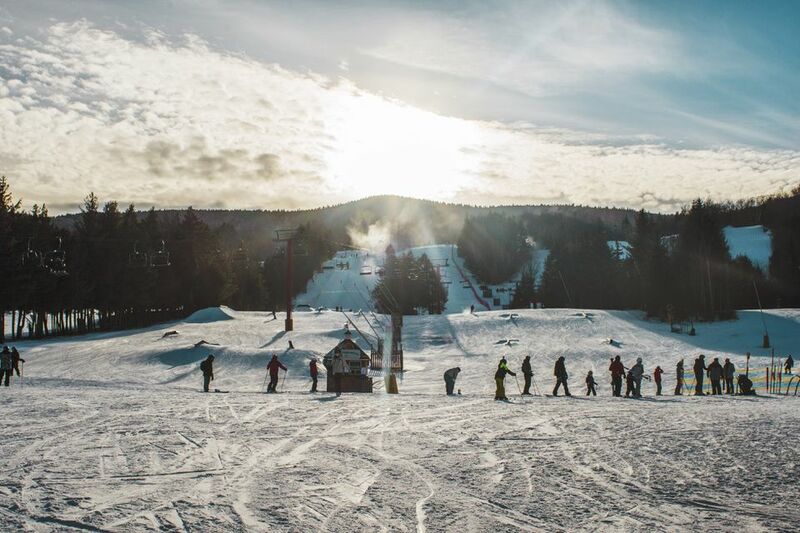 In December 2018, Hunter Mountain opened up Hunter North, a new expansion to the resort that increased skiable acreage by 33 percent (240 acres to 320 acres), which is the largest expansion to an East Coast ski resort in 15 years, according to Hunter. The expansion includes the opening of the new Northern Express Lift (a high-speed, six-passenger chairlift) and nine new trails comprising four intermediate runs (blue square), one beginner run (green circle), and four new glades (upping the total resort count to 67 trails). Hunter Mountain also maintains bragging rights with some of its off-slope activities. It is home to the largest snowtubing park in the state and the highest and longest zipline canopy tour in the country. Hunter Mountain has 320 skiable acres; 1,600-foot vertical drop; 25% beginner; 30% intermediate; 30% advanced; 15% expert. Advanced: Ski black-diamonds (Upper Highlands and Upper Hemlock) at the top of Hunter East. Others include The Colonel’s Alternate, Taylor’s Run, Milky Way, Lower Crossover, Hellgate, and Bleecker Street. Experts will enjoy the double-black diamonds on Hunter West: Annapurna, Westway, Clair’s Way, Which Way Glades and, lower on the mountain, Racer’s Edge. Find freestyle black-diamond terrain on Empire Park, Park Avenue, Park Avenue West, and Drop-Off. Intermediate: In the middle of Hunter East sit four blue square trails: Lower Highlands, Central Park, West Side Glide, and the curvy Rip Van Winkle. Others include Way Out, Rip's Return (both located on Hunter North), Lower 42nd Street, Upper 42nd Street, 7th Avenue, Broadway, White Cloud, and the long Belt Parkway. Beginner: Green circle trails on Hunter East include Briar Patch, Boston Road, and Fordham Road. Elsewhere, find Fifth Avenue, The Battery, B Flat, Off-Broadway, and KMC Drive. Note: Hunter North has one new beginner route called Rusk Road, but in order to reach it, you have to take one of the intermediate trails from the lift. In the “Slow Zones”, beginner trails include Learning Zone, Bucky’s Run, Gramercy Park, Madison Square, Central Park North, Gateway, and Mossy Brook. For the 2018-2019 season, lift tickets are $79 and $89 for adults (18-64), and they cost $61 and $68 for children (7-17) and seniors (65+). (The two prices listed are weekday rates and holiday/weekend rates, respectively.) Toddler prices (ages 1-6) are $10 a day with a paid adult ticket. Discounts are provided for U.S. Military personnel, nearby students, multi-day passes, afternoon-only skiing, and passes purchased online in advance. On Sundays, sleep in and purchase $39 lift tickets after 12 p.m.
Van Winkle’s Restaurant: With fine dining (filet mignon and rack of lamb) and pub fare (pizza and mozzarella sticks) in the same on-site Kaatskill Mountain Club Hotel restaurant, everyone in your party will find something to keep them toasty in an equally warm ambiance. Menus change seasonally. Executive chef and manager Tim Lang is a Culinary Institute of America graduate. Scottie’s Summit Lodge: At a 3,200-foot elevation, dine on soup, chilis, hot dogs, baked potatoes, burgers, and sandwiches without leaving the slopes. Pika’s Waffle Stop: Make a pitstop on the slope at the bottom of the Empire Terrain Park for Belgian Liege Waffles, made with a special Belgian sugar and dough instead of batter. The Main Bar: On the main floor, north side of the lodge, at the Main Bar, you’ll find drinks with TVs for watching games, live bands, and DJs. Coppertree Bar: Grab a well-earned drink (beer, wine, or cocktails) while you enjoy the mountain views. The Marketplace Food Court: On the main floor of the lodge, slopeside, find ski resort classics like soup, chilis, sandwiches, burgers, hot dogs, and french fries alongside burritos, wraps, and more. For a complete list of restaurants, check the website. Hunter Mountain Rental Shop on the upper floor of the Learning Center offers Burton snowboards, boots, and bindings; Head skis, boots, and helmets; and other brands. Rental rates begin at $43 for one-day rentals of skiing or snowboarding equipment for adults and $35 for children. While the majority of the equipment available is to-learn or beginner, there is a small fleet of performance equipment to rent. Adults (13+) can take private, group, progression, or seasonal lessons at different levels. Kids programs include the use of a special SunKid conveyor lift. Group lessons are separated into Explorers (ages 4-6, skiing only) and Mountaineers (ages 7-12, skiing or snowboarding). Camps and workshops are available (for example, an "Intro to Bumps" workshop to learn to ski moguls). While Hunter Mountain may not have as many alternatives to skiing and snowboarding as larger ski resorts in the East, what they do have, they don’t skimp on. Snowtubing: The largest snowtubing park in the state is at Hunter Mountain. Lanes are almost 1,000 feet long. Two-hour sessions are $20 a person in the 2018/19 season. There’s also a snack bar and a firepit. Ziplining: With the highest and longest zipline canopy tour in the country, Hunter Mountain offers five miles of zipline, heights of up to 600 feet, and speeds of up to 50 miles an hour. There are three thrill levels: Adventure Tower (the easiest - four stories of climbing, rope bridges, and cable walks); Mid-Mountain Tour (the middle - short ziplines, rope bridges, swinging bridges, and more); and Summit Skyrider (the most adventurous - criss-crossing, zipping from peak to peak and back again). Reservations are recommended. Spa: Hunter’s Mountain Club Spa offers luxury treatments using custom products with natural ingredients from the Catskills. Treatments include massages, facials, and more. Stay slopeside at the ski-in, ski-out Kaatskill Mountain Club in a suite with a full kitchen and access to a year-round indoor and outdoor heated pool, two hot tubs, a sauna, a steam room, fitness center, the full-service Mountain Club Spa, and more. Explore the area’s hotels, motels, B&Bs, and inns for additional off-site options. Thompson House in Windham (about 10 miles away) is on our list of best ski hotels in New York.